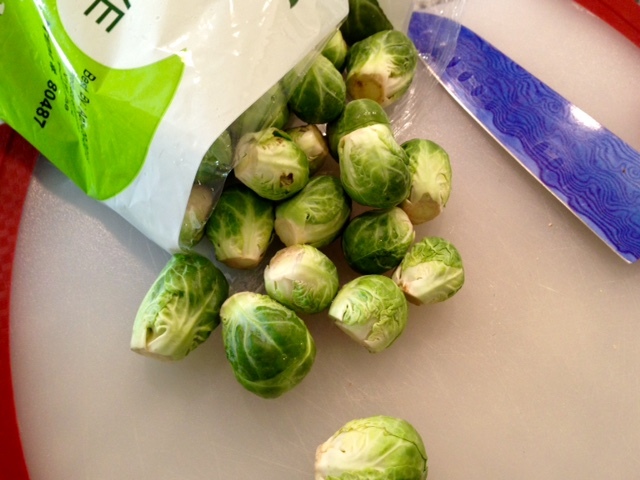 My Favorite Veggie: Brussel Sprouts…hahhhh?! I’ve been an unapologetic carnivore for most of my life. When I was a kid, my Mom would take my sister and me out for Chinese and we would both order Almond Chicken. In ten minutes flat I would have picked through my meal and polished off all of the chicken, leaving every morsel of vegetation on the plate. My older sister, a veggie lover from day one, would scrunch up her nose as she picked out the chicken from the celery, carrots, and almonds, eating only the vegetables and nuts and leaving all the meat behind. If we ever asked for seconds, my ma would switch our plates and we would both be happy. Two decades later, I’ve come to recognize the benefits of cruciferous vegetables and green smoothies, but sometimes when I sit down to a plate of veggies for dinner I still remember the days when I refused to eat any vegetables other than cream-laden mashed potatoes and corn (a grain, come to find out, not a vegetable! Super disappointing as it’s so delicious with lots of butter and salt). These days, I relish a night of eating alone on the couch, my plate heaped high with salad, Brussel sprouts, steamed broccoli, and a sweet potato. I still feel sheepish serving a meal like this when my boyfriend’s home or when I’m serving friends or family, assuming everyone is happier with a big hunk of meat on their plate. Each week at Whole Foods, I make a point of picking out a vegetable that looks strange or that I’ve never tried. I Google some ideas on how to prepare it and give it a shot. I’d say 60-70 percent of the time, my recipes could use some tweaking, but the point is I’m expanding my vegetable horizons; a healthy, noble even, pursuit. If you would have told me five years ago that my favorite vegetable would be Brussel sprouts, I would have laughed in your face and told you were crazy. They’re mini cabbages! Who adores mini cabbages?! I do, apparently. But it took some finesse to make them into the delectable morsels I now crave on a weekly basis. 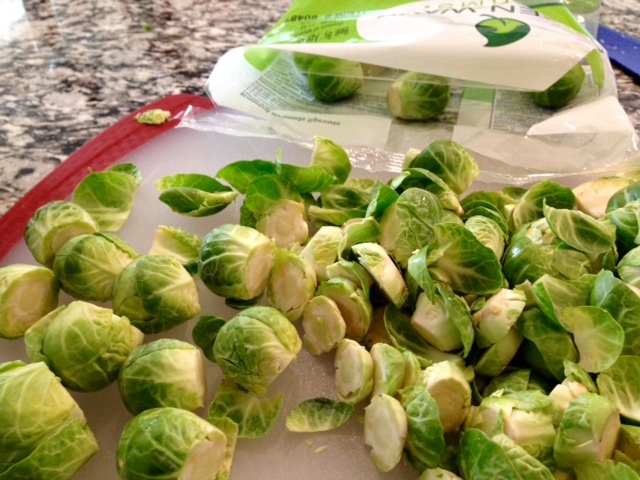 Before you go all, “Ugh, Brussel sprouts are the worst,” check out the recipe for these gems. Making this delicious side dish (or main, which is sometimes how I eat them), is a cinch because my devoted readers already have the recipe for the sauce you’ll need to make these mini cabbages ultra-delicious. Here’s the link to my sweet, salty, tangy balsamic vinaigrette that pairs so beautifully with this veggie (http://www.amyburnstherecipebook.com/balsamicvinaigrette/). 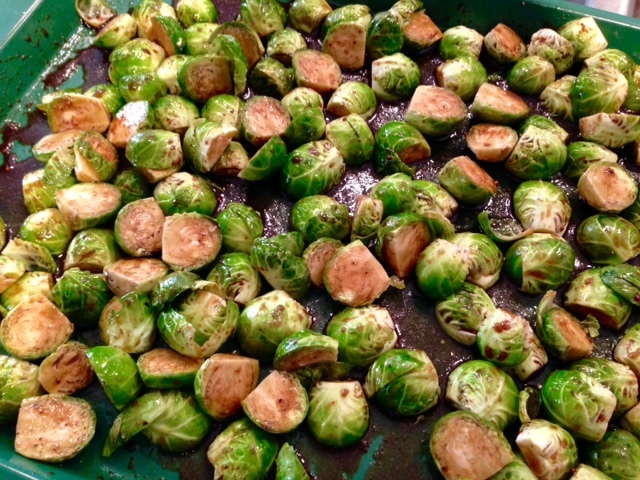 When you pour this magical sauce over the otherwise ordinary Brussel spout and roast them in the oven, you get a simultaneously crispy and tender, rich, satisfying veggie. Who knew there was such a thing? I love the individual leaves that separate from the sprouts and soak up the extra balsamic, becoming extra crispy, maybe even a little charred. Pair these babies with a couple of other veggies and enjoy yourself a meatless Monday, folks! 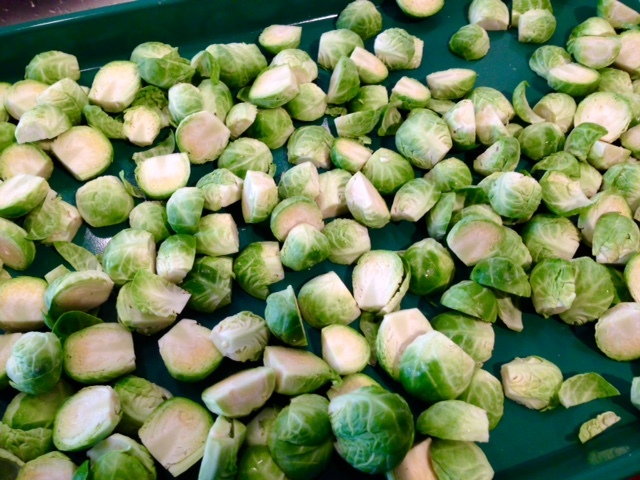 Remove ends from Brussel sprouts, peel away outermost leaves, and cut in half. I know, it takes forever and drives me nuts too. Patience is not my superpower. Stick with it. Place on a large sheet tray and drizzle with the balsamic vinaigrette. Toss to coat and then sprinkle with salt and pepper. 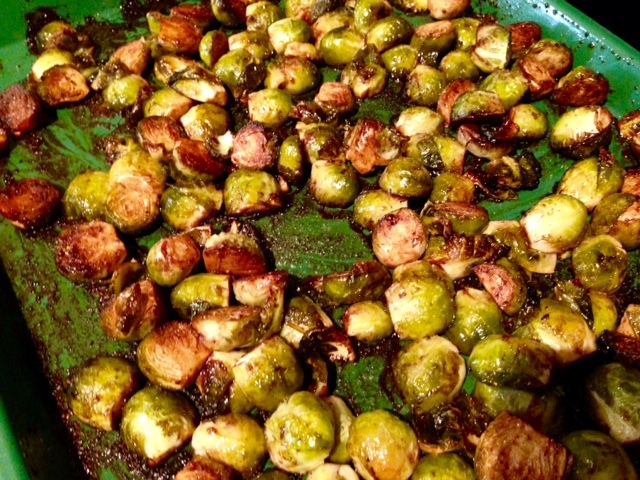 Bake in the oven for 15 minutes, and then stir to flip the Brussel sprouts, returning them to the oven to cook another 10-15 minutes until brown, crispy, and all of the vinaigrette has absorbed into the Brussel sprouts.